When it comes to travel accommodation, we tend to pick the most economical option so as to save our dosh for the other things. That means we’ve all got our fair share of accommodation horror stories – bed bug-ridden hostels, atrocious views, sub-par amenities. We’ve decided that we’re not going to settle anymore – from now own its luxurious accommodation all the way. Sites like AirBnB give travellers more accommodation options than ever, especially in the comfort stakes. We’ve put together five dreamy destinations that are so luxe that you’ll be sorely tempted to stay forever. The Great Ocean Road is one of the most visited destinations in Australia and for good reason – the scenery is jaw-droppingly amazing. The Pole House is a unique house that is perched above a particularly scenic stretch of the road in Fairhaven, and when we say perched, we mean it. The house – built by Frank Dixon – is suspended 40 metres above the ground, offering panoramic views of the coastline as far as the eye can see. Residents can watch the world pass by from the balconies, or let the sun and sea inside through the floor-to-ceiling windows as you luxuriate inside on the reclining couches near a suspended fireplace. The amenities are top-notch, creating the perfect blend of style and comfort for your next holiday. Speaking of merging the elements, this oceanfront property is something to behold. 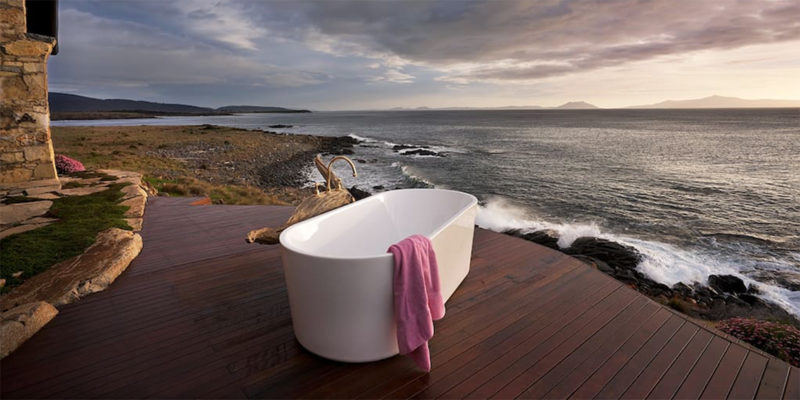 Thalia in Tasmania sits on the edge of the Great Oyster Bay, overlooking rugged coastline and undisturbed beaches. These ancient-stone cottages clustered around a central courtyard contain warm furnishings and top-notch facilities – the kitchen and dining room opening out to the sea, the fireplace in the living room is perfect when the weather outside is cold, but if you’re keen to brave the elements there is a bathtub and a sauna on the deck overlooking the water. Oh, and the nearby beach is yours to explore – dolphin and penguin sightings are common. This abode is closer to a Moroccan villa than a South Australian beach house, which is what makes it a remarkable holiday house. 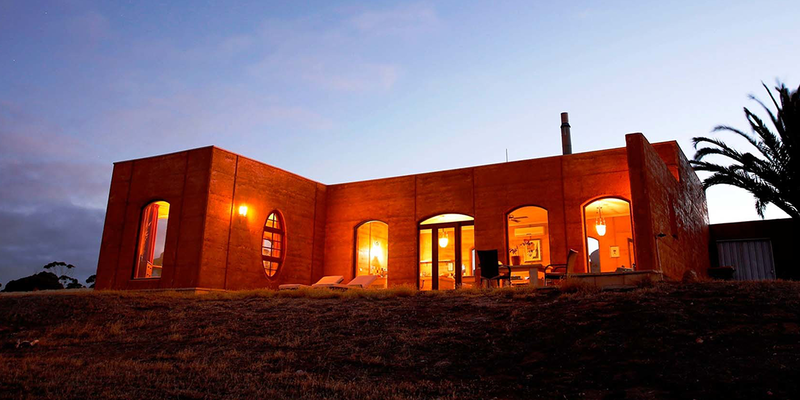 Located on the highest point of the property on which it sits, this rammed-earth building offers sweeping views of the coastline and some incredible architecture that will have design buffs enraptured. Private outdoor terraces and courtyards are perfect for dining with a view, while inside sits a slow-combustion fireplace and a sizeable Villeroy & Boch bathtub for soaking until your heart’s content. Oh, and you might even get a glimpse of some wildlife here and there. You are on Kangaroo Island, after all. Now, this is a special abode. Designed and built by an award-winning sustainable builder, this home is perfect for anyone who has ever dreamed of living like a hobbit or simply loves feeling connected to nature. 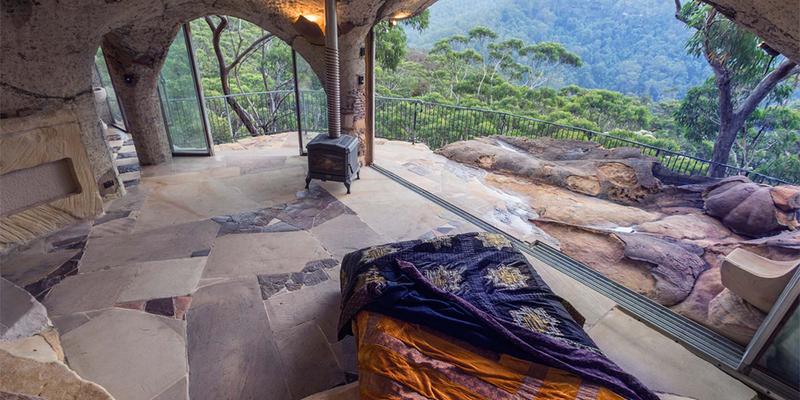 The Enchanted Cave is found in the heart of the Blue Mountains and is built into a natural rock platform. Fire up the fireplace and watch the light bounce off the cave walls, recline in a bed set into the bedrock, soak in the en-suite spa with hand-cut rock tiles, sunstone basins (or cool off in the external shower on the front deck), cuddle up with your significant other on the lovers seat, or watch the sun set or rise over the valley – you’d be hard pressed not to be enchanted by your stay here. When your accommodation has won the Architecture Award for a New Home, then you know you’ve picked a winner. This stunning abode in Gordons Bay offers three levels of unparalleled luxury, with five bedrooms, five and a half bathrooms, a pool, private gym, a sitting room with an open bar and a fireplace and a media room. 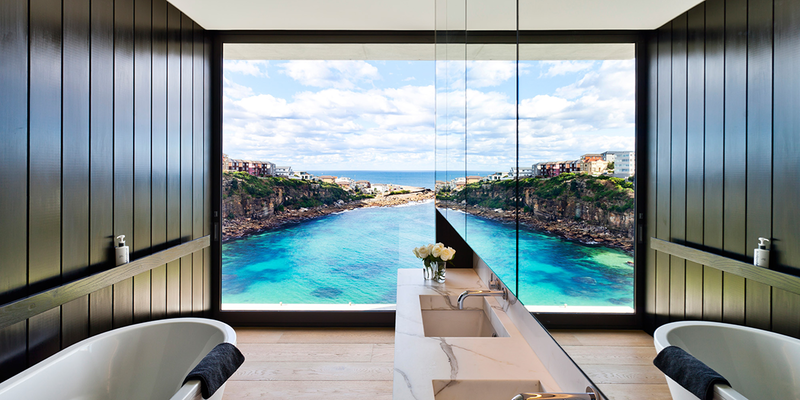 That’s not all – a casual glance out of any of the full-length windows will give you a spectacular view of Gordons Bay and Sydney’s headlands. Guests can take advantage of direct access to the beach with a private boat ramp and it’s a short drive to Bondi. If you’ve got a bit of money to throw around, then this can be your summer holiday spot.